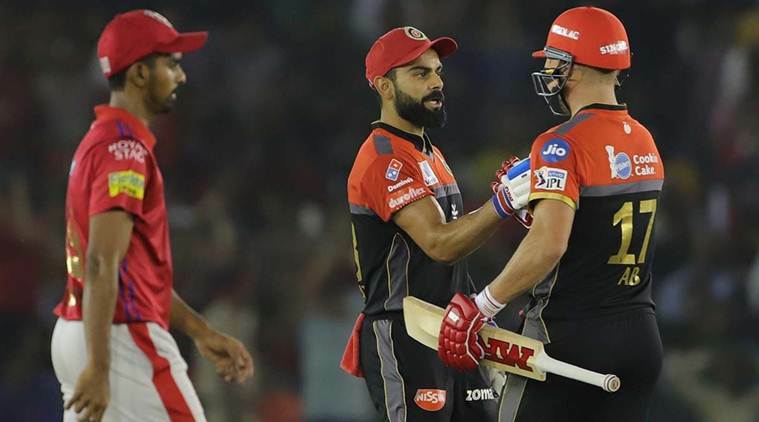 Royal Challengers Bangalore picked up their first win in the 2019 season of Indian Premier League as they defeated Kings XI Punjab in an away game on Saturday. The Virat Kohli-led side chased down the target of 174 runs with 8 wickets still in hand. Kohli and Ab de Villiers scored fifties each for their side, while Marcus Stoinis played a cameo in the chase. RCB won the toss and elected to field. The side made only once change, replacing fast bowler Tim Southee with Umesh Yadav. KXIP made three changes into their side, replacing Hardus Viljoen, Karun Nair and Ankit Rajpoot with Andrew Tye, Mayank Agarwal and Murugan Ashwin. Swashbuckling opener Chris Gayle missed a well-deserved century by a whisker, smashing an unbeaten 99 off 64 balls to power Kings XI Punjab to a 173 for four against Royal Challengers Bangalore in an IPL match Saturday. The 39-year-old West Indian, who had suffered a back spasm after last match, carried his bat, recording his highest score of this IPL season blasting five sixes and as many as 10 hits to the fence to single-handedly anchor the Punjab innings. Invited to bat, Gayle stitched a 66-run opening stand off 38 balls with KL Rahul (18) and kept the scoreboard ticking even though he lost partners on the other end at regular intervals. RCB could have dismissed Gayle in the first over itself when he was hit on the leg by Umesh Yadav but Kohli didn’t go for a DRS and the West Indian escaped. The fans finally got to see the best of Virat Kohli and AB de Villiers’ partnership as the two stalwarts took their side to an easy 8-wicket victory. Skipper Kohli led from the front as he hammered 67 in 53 balls as RCB chased down the total of 174 in 19.2 overs. The Proteas teammate played an exemplary supporting role, scoring 59* in 38 balls. The duo stitched a 75-run partnership after Parthiv Patel’s fall early on in the powerplay overs. After Kohli’s fall, de Villiers carried on along with Marcus Stoinis to take RCB home. The spinners Murugan Ashwin and R Ashwin managed to control the run flow in the middle overs. Murugan gave just 24 runs in his 4 overs, while the skipper gave 30 runs in his 4 overs and claimed a wicket. But in the end, it was not enough to curtail Stoinis and de Villiers who were able to chase down the total with 4 balls to spare. The 18th over from Andrew Tye was certainly the gamechanger in the match. After losing Virat Kohli, RCB were shackled by the skipper R Ashwin in his over, who just gave away six runs. With three overs remaining, RCB needed 38 to win with Marcus Stoinis and de Villiers in the middle. Ashwin handed the ball to Tye and in the over, nothing went RCB’s way. In the first two balls, Stoinis hammered two boundaries. He skied a ball in the air in the next ball which went straight to Murugan Ashwin, but he dropped it. Facing his first ball in the over, de Villiers hammered a six. Tye gave away a total of 18 runs in the over, thus bringing the equation down to 20 in 12 balls.